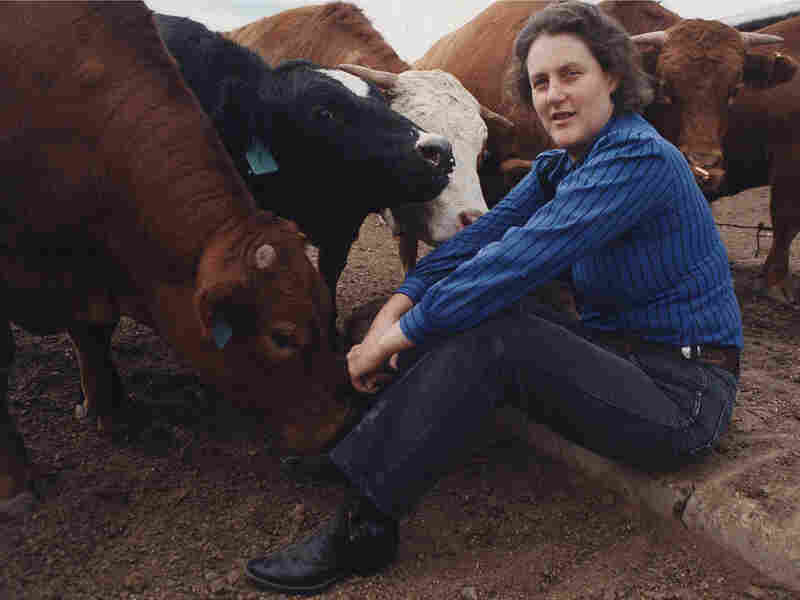 Temple Grandin: A Life Devoted To Animals Temple Grandin has devoted much of her career to improving the treatment of livestock animals. Her advocacy for their improved conditions and handling has gained her an ardent following -- her latest book Animals Make Us Human: Creating the Best Life for Animals is now a bestseller and Claire Danes plays her in a soon-to-be-released HBO biopic. Temple Grandin, pictured here, the subject of a new HBO biopic, set to air in February. Temple Grandin has devoted much of her career to improving the treatment of livestock animals. Her advocacy for their improved conditions and handling has gained her an ardent following -- her latest book Animals Make Us Human: Creating the Best Life for Animals is now a bestseller and Claire Danes plays her in a soon-to-be-released HBO biopic. She talks with NPR's Neal Conan about her work and how her own experience with autism has influenced her research. Temple Grandin sees the world in pictures rather than in words. And that ability, she says, allows her to experience the world in some of the same ways that animals do. Youve probably read or heard about here ground-breaking work to redesign Livestock Handling Systems around the country. You may also know that she is autistic and spends a lot of her time explaining how that makes her different, not less. You may not know how she avoided being institutionalized as a young girl, how she learned the social skills to engage the world, and how she overcame bullies, skeptics, ignorance, and her own fears to make a real difference in the world. A biographical movie about the life of Temple Grandin premiers on Saturday, February 6th on HBO. It stars Claire Danes. In this scene she prepares for the first time to use the circular cattle shoot she designed to let cattle proceed calmly into the slaughterhouse. Ms. CLAIRE DANES (Actor): (As Temple Grandin) I touched the first cow as it was being stunned. In a few seconds it was going to be just another piece of beef, but in that moment it was still an individual. It was calm. Then it was gone. I became aware of how precious life was. I thought about death and I felt close to God. CONAN: Later in the program, Robert Kagan joins us to argue that protests in Iran have changed the calculus on regime change. But first, Temple Grandin. If youve questions for her about her life or about living with autism, our phone number is 800-989-8255. The email address is talk@npr.org. You can also join the conversation at our Web site, thats at npr.org. Click on TALK OF THE NATION. And Temple Grandin joins us from the studios at Chicago Public Radio. And its nice to have you on TALK OF THE NATION today. Dr. TEMPLE GRANDIN (Colorado State University): Its really good to be here. CONAN: And I wonder, did HBO get the story right? Dr. GRANDIN: Yes, Claire Danes was just brilliant in playing me. The movie is all in the 60s and the 70s, when I was a lot more autistic acting and when I first started my work. CONAN: Theres a picture of you on the Web standing next to Claire Danes at a premier, at the screening of this film in New York last night. Dr. GRANDIN: Well, the thing was amazing is how Claire totally changed into me. You know, if you look at her from a picture from last night at party youd never think that, you know, that she could become like me. I mean, shes just amazing, and how she totally turns into the character that shes acting. CONAN: And that is a skill that actors have. You, of course, have special skills too and this movie is about how you became aware that they were special and then how you learned to apply them to a very specialized set of circumstances. And there is a number of circumstances I wanted you to talk about - and I was unaware of this - that you benefited so much from a series of wonderful teachers beginning with your mother. Dr. GRANDIN: actually built from the original drawings. Also they showed how my visual thinking mind works. I think its important for educators to understand different kinds of minds work. CONAN: I think thats interesting too - they use graphics, blueprints and sort of move very rapidly to show how you conceive - of course you can see them in 3D and even a good movie doesn't have 3D yet on TV. Dr. GRANDIN: Well, the other thing that I did - there was one scene in there were my science teacher says to me, you know, think about the word shoe. And a whole bunch of still pictures of shoes just came up in rapid succession. Thats exactly how I think. Its just like a search engine Google for pictures. CONAN: And when was it that you became aware that most of the rest of us dont think that way? Dr. GRANDIN: Well, I really became aware when I did one of my earlier books thinking in pictures, because I interviewed other people about how they think. Like if I say to you, think about a church steeple, I only see specific ones and I can tell you exactly where theyre at. And I was shocked to find out that most of the people see a generalized sort of vague generalize generic steeple. For me theres no generalized one. Theres only lots of different specific ones. CONAN: Interesting, when we put out words that youre going to be on the program today, we got some questions send in on NPRs health blog, called The Shot, and heres an email from Al Hersch(ph). I was very fortunate to see a screening of this amazing film and what I missed was the pace at which you began speaking and learning between the age of four, which is parenthetically when you were diagnosed with autism, and when you became a teenager. Was the pace consistent? Did you attend typical school at a young age as the mother of an autistic eight-year-old who makes gains in baby steps? You were always looking for that nonexistent the crystal ball. Dr. GRANDIN: Well, I went to a normal school but it was small classes, older experienced teachers, and back in the 50s classes were highly structured. The 1950s structured social life was good. I was taught turn taking games, Parcheesee board. I was expected to have table manners. If I went into the store and I pulled something off the shelf, I was immediately told, you know, not to do that. From a very early age I could do things like go to a restaurant and shop, becuase parents just wouldnt allow bad behavior on those places. CONAN: But what pace did you learn to speak at? Do you remember? Dr. GRANDIN: Well, I can remember the frustration of not knowing how to speak, and my words came in a few stressed words at a time, you know, and then gradually I got more and more fluent. And theres another kind of autism where the kids are acheilic(ph). They really smoothly, yacking TV commercials, but they dont know what they mean. CONAN: Theres all kinds of autism, and thats another thing that we learned in the process of this film, that peoples mind can turn into well, the "Rain Man," sort of autism, for example, where youre master of numbers and statistics. Dr. GRANDIN: Well, thats just one type of autism. Autism is an extremely broad spectrum going from people that are going to remain nonverbal, lots of times many of them neurological problems, up to brilliant scientists. You know, the mild autism or Aspergers, you know, another name for that is geeks and nerds; there's no black and white dividing lines between geeks and nerds, so they would make fantastic radio station engineers. It is continuum of trace. Dr. GRANDIN: Yes. But your stations are not going to run without them - we need them. CONAN: And in fact youve talked about one of the - you suspect that in fact theres been a large increase in the number of diagnosed cases of autism and indeed Aspergers, the milder form of this, and you suspect that these were, at least many of them, undiagnosed cases before. Dr. GRANDIN: Well, the Aspergers is just increased detection. I mean, I can think back to when I was in elementary school and high school of other students that definitely would be labeled Aspergers today, but where I think that maybe a true increase is on some of the very severe autism where the kids lose language after having a language. I think that regressive subgroup has increased. CONAN: Okay. Let me ask you about the theme of this picture and that is you mentioned your frustration, another of the frustrations had to have been the way youre teased and bullied by people in schools who didnt understand what you were going through? Dr. GRANDIN: Well, its absolutely terrible. And I know a lot of other kind quirky geeky kids - I mean, theyre by being teased. And the only place where there was no teasing for me was - Mr. Carl. We actually gave me honorary doctorate for the movie but, you know, Dr. Carl Ox's(ph) science lab, rocket club, and horse back riding. The kids that were interested, knows things, did not do the teasing. I cannot emphasize enough with these quirky, geeky kids, we need to get into the shared interest things. And not everybody is a visual thinker. Some are more of a mathematical thinker. Others are a word thinker. But they tend to be really into detail and we need to get them into special interest activities where they can get friends through those special interest activities. CONAN: The teasing and bullying did not stop when you left school. Theres a scene Im going to play from the movie now and this is after youve gone back to youve returned back to talk to the science teacher you talked about. Hes played by David Straitharn. You designed a circular dip vat, which is basically a large trench-like shoot filled with different chemicals and pesticides, decontaminates cows who maybe carrying a disease, but its been described as brilliant by somebody you showed it to, but then the next day skeptical cowboys who were - had to use it said, This is ridiculous, we're going to tear it down - set about changing it, and it resulted in the death of some cattle, and here you would drive all the way back all night to the home of your high school teacher. Ms.�CLAIRE DANES (Actor): (As Temple Grandin) Cattle aren't dangerous. Unidentified Person #1 (Actor): (As character) Temple? Ms.�DANES: (As Temple) And they're predictable. So it's not hard to try to (unintelligible). Unidentified Person #1: (As character) What are you doing in California? Ms.�DANES: (As Temple) But the cowboys would rather prod them and scare them. Unidentified Person #1: (As character) Did you drive all night? Ms.�DANES: (As Temple) (Unintelligible) see and think and behave, and the owner of Cattle Magazine said it was a masterpiece, but the cowboys killed three cows in it, three, in five minutes, because they wouldn't follow my design. Unidentified Person #1: (As character) Temple, would you like to sit down? Ms.�DANES: (As Temple) Well, I can't protect the cattle unless I design the whole system from the moment they enter to the moment they get slaughtered. CONAN: And eventually, of course, you do get to design the whole system, and we see that happen, as well, but nevertheless, that kind of frustration and that kind of unwillingness to accept your ideas, to even consider that those idea might be possible, how did you overcome that frustration? Dr. GRANDIN: Well, it is frustrating. Fortunately, I had other clients that did not do those things. I had really good clients. You know, when I first started out in my career, I thought I could fix everything with engineering. You know, engineering can only fix half the problems. The other half is management, and I was very frustrated with that. I had a lot of facilities messed up and wrecked. You know, the corporations, they'd buy the facilities, but you know, (unintelligible) was a real problem. And then I developed a scoring system for evaluating meat plants, and in 1999 I trained the McDonald's food-safety auditors to implement that scoring system, simple scoring system. We actually count moos. If you're a McDonald's client, you're allowed to have three cattle out of 100 mooing in the stunning area, and if more than three cattle out of 100 moo, you fail the audit, period. And that resulted in huge change because it forced people to manage those facilities. CONAN: And that's not the only change you had to make. You were obviously really good at some of these skills, seeing those things in pictures and three dimensions. The social skills, well, those were much more difficult for you to manage. Dr. GRANDIN: Well, I have to learn social skills sort of like being in a play. You know, I didn't know that people had all these little secret eye signals until I read about them in a book when I was 50 years old. CONAN: That's interesting, not till you were 50 years old. Dr. GRANDIN: Well, you know, it may have helped because, you know, there were other feed yards that didn't kick me out, and I'm sure the cowboys were rolling their eyes and everything, but at least I didn't recognize that. As long as they didn't totally kick me out, I was happy, you know, to be there. CONAN: And you obviously did find people who were receptive to your ideas, and as the tag in the film says, you have transformed this entire industry in North America. Dr. GRANDIN: Well, half of the cattle are handled in that conveyor system that's shown in the movie, and that's in all the big plants now, and that's about half the cattle in the U.S. and in Canada. The other big thing I've worked on is this auditing system, because I found I could not fix everything with engineering, and I had a lot of places that were wrecking equipment, and I don't want to go into what they were doing to the cattle, and I developed this very simple scoring system. You measure moos, you measure electric prod use, falling down, their stunning score, and they'd better get all those cattle unconscious, and it's got hard numbers, like speed limits, and they've got to make certain numbers to pass. CONAN: We're talking today with Temple Grandin about her life and the new biopic that debuts on HBO next week. If you have questions for her about her life or about living with autism, give us a call, 800-989-8255. Email us, talk@npr.org. Stay with us. I'm Neal Conan. It's the TALK OF THE NATION from NPR News. CONAN: This is TALK OF THE NATION. I'm Neal Conan in Washington. Temple Grandin is famous for, among other things, convincing McDonald's to institute more-humane slaughterhouses. She has helped revolutionize the cattle industry. She's also done a lot to change the way people think about autism. Her life is a remarkable story. It's been made into a movie. HBO's "Temple Grandin" premieres Saturday, February 6. Temple Grandin is professor of animal science at Colorado State University, her latest book, "Animals Make Us Human: Creating the Best Life For Animals." If you have questions for her about her life or living with autism, our phone number is 800-989-8255. Or send us an email, talk@npr.org. And let's get some callers on the line. We'll start with Shireen(ph), Shireen with us from Elk Grove in California. SHIREEN (Caller): Hi. Temple, can you hear me? Dr. GRANDIN: Yes, I can hear you just fine. SHIREEN: Great, thank you. I work in the Elk Grove School District, and we have, you know, good special education programs. I'm a program specialist and work with programs, families and students. One of the things I'd like to know is regarding young adults with autism. If we focus on school-to-adult-life-transition planning experiences or education, what would you say, from your experience, would be the most helpful with young adults to give them experiences that'll prepare them for, you know, their ability to be in the world independently and having, you know, positive outcomes for their adult lives? Dr. GRANDIN: Well, I mean, everybody, regardless of where they are in the spectrum, needs to learn things like showering, getting dressed, manners, how to behave in a store. You don't pull merchandise off the shelf. Everybody has to learn that. But then, you know, one of the things I've observed is that special educators really know what to do with some of the more severe individuals, but they don't know what to do with the smart, geeky kid, and they don't have enough expectations for the smart, geeky kid, and those are the ones that ought to be working out in Silicon Valley. But you know, you get out in the Midwest, in places where you don't have those kind of tech industry, they don't have enough expectations for what some of those kids could do. So there's sort of like two kinds of tracks. I'm seeing some very, very smart kids going down the wrong track, and that just makes me crazy. I'm also seeing some really smart kids no manners at all come up to the book table with their finger up their nose, combing their hair with their fork. This is stuff that I learned not to do when I was like six. SHIREEN: And in the you mentioned types of special interests. CONAN: I wonder, are there things like rocket clubs, Shireen? Are there things like rocket clubs that Temple had so much fun with in her high school? Do you have things like that in your school? Dr. GRANDIN: Maybe not rocket clubs, but how about Lego Mindstorms? Oh, sorry. Art, math? CONAN: You do have things like that, all right. Well, good, thanks very much for the call, and we wish you the best of luck. SHIREEN: Thank you so much. CONAN: Here's an email, again from the blog The Shot. Erica(ph) wants to know: What role does friendship play in your life? Dr. GRANDIN: Well, I had some really good friends when I was in high school, and it was all through shared interests. I had a roommate, Carol(ph), and we loved to ride horses together, and we also loved to have our collections of plastic horses together too, and we'd decorate our plastic horses and build fancy tack for them. But again, most of my friends have been shared interests. Some of my really good friends were in the construction business, and when we were out building equipment all the time, I mean, some of the best time I had was sitting around with the guys and we were talking about how to do the concrete forms or the steel work. Again, it gets back to shared interests. CONAN: But on an emotional level, it's difficult? Dr. GRANDIN: Well, it's more on an interest level. You see, the thing is, my life is intellectually complex, but it's emotionally simple. We had good times. I mean, sometimes we'd be laughing in that construction trailer. We're talking about the world's worst vomit flights or something like that. Dr. GRANDIN: You know, a really good member of the 10-year-old little boys club. CONAN: Let's get another caller on the line. This is Trish(ph), Trish with us from San Antonio. TRISH (Caller): Hi, Temple. I had the pleasure of hearing you speak last year in Austin, and after you spoke, you went out into the hallway, and the conference was on a break, and the hallway was small, it was crowded, it was loud, it was chaotic, and everybody was wanting to talk to you. And I was just wondering, from a sensory aspect, how if that's still difficult for you and how you learned to overcome it. I have a five-and-a-half-year-old with Asperger's, and situations like that are quite a challenge for him, where there's a lot of noise, a lot of people and chaos. Dr. GRANDIN: Well, sensory issues are extremely variable. I had problems with the school bell going off. That was bad. Some kids can't tolerate fluorescent lights. Other kids can't tolerate smells in the detergent aisle at the market. It's going to be very variable. You know, now, I have sensory problems, but they probably were not the most severe. I still have some problems with loud noise. The one thing I cannot stand is scratchy clothes against my skin. I have to wear soft T-shirts under most of my shirts. I wear underwear inside out. I have a hard time finding jeans that don't itch. That's probably my biggest problem - real, real variable. One of the things to do is to gradually expose the child to sounds where he initiates the sound, first of all at a very low volume, you know, put it on some kind of recording device, not a compressed MP3 file, it's got to be full-frequency, and he gradually can turn that sound on louder and louder. Sometimes that helps. Another thing that helped me is I've been antidepressant medication since my early 30s, and that tended to damp down the sound-sensitivity problems, can't emphasize enough on antidepressant medication for anxiety - tiny, low doses - and I talk about that in "Thinking in Pictures." TRISH: Okay, thank you so much. CONAN: Trish, thanks for the call. There's a scene in the movie that describes this. You've just gotten your Masters degree in science and come back East. There's a Christmas party. Julia Ormond, who plays your mother, you have a panic attack from all the people and the sound and the noise, and your mother comes to your bedroom to console you. Ms.�JULIA ORMOND (Actress): (As Eustacia) Temple, look at me. Look at me. Do you know, people tell each other things with their eyes. This is me telling you that I love you, and I respect you. Ms.�DANES: (As Temple) I will never learn how to do that. CONAN: I wonder: You describe at the age of 50 learning about eye signals. Have you learned to do that? Dr. GRANDIN: Well, you keep learning, but I'm still a geek, and you can't de-geekify the geek. You know, you can teach the geek good manners, and that was done with me, but I get my most happiness in life doing things that make positive change. When somebody reads one of my books and they say, well, your book, "Thinking in Pictures," helped my kid go to college or get a good job, or a mother says that, you know, some of the information I have, you know, helped her son learn how to talk, that makes me happy; or when a cattle rancher tells me the corrals work you know, if I can do things and make positive, real change out in the real world, that makes me happy, because I am what I do more than what I feel. I have emotions, and let me tell you, when those kids teased me, it hurt, and it hurt a whole lot, but they're more like a 10-year-old child's emotions. They're simpler. CONAN: Was it difficult to see those scenes again in the movie? Dr. GRANDIN: Yeah, yeah, because I understand, you know, that, you know, mother was really upset about that, and there's you can learn social skills, but there's a kind of an emotional connectedness that's just not there. And the things I get the most excited about are things that I do. And the thing is, if you didn't have people in this world that were interested in things, we'd still be living in caves because who do you think made the first stone spear? It wasn't the social yak-yaks around the campfire. CONAN: Let's get another caller in. This is Charles, Charles calling from Homewood in Alabama. CHARLES (Caller): Hello, how do you do? CHARLES: I wanted to ask Mrs.�Temple a question, if I may. I suffer from Asperger's or afflicted with or whatever doctors tell me I'm afflicted or suffer with. Don't you hate it when you are presented a problem, and in the autistic brain you immediately form many different structures and ways of solving it, and yet everyone else in the same room is still left in the dark? Dr. GRANDIN: Well, one thing I learned I had to do, because the autistic brain tends to give you lots and lots of different ways to solve problems, I had a principle I had to learn called finding the basic principle. How do you find the one answer that's the best answer? And you have to kind of learn to do that, and I also had to learn that if someone asks me to explain something simple, they don't want a half-an-hour long discussion on it. CHARLES: Yes, ma'am. All right, well, thank you. CONAN: Thanks, Charles. This is another question from the blog. Molly writes: I'm curious what you think about animal transportation in the United States. It would seem the transportation in the trucks I see in transit currently would cause a great deal of stress, pain and fear, especially in high-fear animals like horses. I've seen several news articles about injuries sustained by horses when shipped cross-country to Canada or Mexico. What are your thoughts and feelings on animal transportation? What would you like to see changed? Dr. GRANDIN: One of the biggest things you have to do in animal transportation is management. There's actually been some studies that have shown a big difference between drivers on things like injuries - I mean, drivers that stomp on the brakes, they stomp on the gas. It throws the animals off-balance, you know, people handling animals going on and off the trucks. There are some cattle trailers that definitely are not appropriate for horses. But so many of the problems of management with - excuse me - with transportation are bad management. And one way I would go about assessing transportation is bruises, injuries, and - you want to get that down to an exceedingly low level. CONAN: That should be taken into account, as well as what time did you get the cattle there. Dr. GRANDIN: Well, that's right. And then you don't do things like park the truck in the sun and just let them cook at a truck stop somewhere. That's another thing you don't do. CONAN: Let's get Taber(ph) on the line, Taber with us from Tucson. TABER (Caller): Yeah, hi. First of all, this is such an honor to speak with you. I actually heard you speak when I was a young man in the military in Denver, when you were speaking about - when you were doing your tour for thinking in pictures. And I remember thinking to myself, wow. It was the first time that ever occurred to me that other people don't think in pictures. And it was really, really an amazing revelation to me. And, of course, the very next thought in my mind was this terrifying thought of, oh, my God, am I autistic? Ultimately, what the doctors labeled me was with attention deficit disorder, not autistic. And I've had many friends in my life who were either autistic or Asperger's. And the parallels between ADD and autism were really quite amazing to me, and I just kind of wanted to see what your thoughts were on that. Dr. GRANDIN: When you get up on the highly verbal end of the spectrum, ADD, ADHD, attention deficit and Asperger's and autism, there's a lot of overlap. And the stimulant medicines tend to help. You get down to the more classically, more sever forms of autism, that's - they're different. CONAN: Is that helpful, Taber? Dr. GRANDIN: There - that's right. TABER: ...you know, I can really accomplish a lot with the way my brain works. Dr. GRANDIN: There's a lot of professions that a visual thinker can really do, especially design work of all kinds. CONAN: Thanks very much, Taber, for the call. Another email, this from Sally in Dayton, Ohio: I first heard about you in your involvement improving slaughterhouse designs some years ago, and very much admire what you've accomplished. I do, however, wish fewer people ate animals. As a vegan and someone who respects and cares deeply about animals and our planet, I was curious about your thoughts on animal rights organizations like PETA and the Humane Society of America. Dr. GRANDIN: Well, when they go find something really wrong, like some atrocious practices on a farm or in a slaughterhouse, just horrible management done, yeah, that needs to be uncovered and those people need to get in trouble for that, and that shouldn't be going on. And in the back of "Animals Make Us Human," I have an afterword, and it's titled: "Why am I Still in the Industry?" One of the reasons why I'm still in the meat industry is when I first start out in cattle back in Arizona, there were a few ranchers that did an excellent job. And they were not killing cattle in a dip vat. They were doing things right. And I remember beautiful Singing Valley Ranch in Arizona, they did beautiful care of their animals. And I could see that cattle, when they're done right, could have a good life. In fact, the cow that raises the calf is always been free range, and that's true whether that meat goes to Whole Foods or it goes to Tyson. You know, if I had started in the industry with egg-laying chickens, you know, my career might have taken a totally different track, because they've got a lot more problems. CONAN: We're talking with Temple Grandin. HBO is debuting a movie about her life called "Temple Grandin" on February 6th. You're listening to TALK OF THE NATION from NPR News. And Lindsey's on the line, calling from Kansas City. LINDSEY: I work with twins that have autism. They're 10 years old, and they are both nonverbal and very violent. And my question for you is how can I redirect them so that they can deal with their peers and not be so violent? Dr. GRANDIN: Okay. Let's just go through kind of a troubleshooting checklist on this. The first thing you have to do is rule out a painful medical problem that they cannot tell you about. And big number one is acid reflux, you know, heartburn-type of things and constipation. They could have a yeast infection, urinary tract infection, tooth - root canal gone bad. You've got to rule those things out. The next thing is it might be sensory. There are some people, especially on the nonverbal end of the spectrum, cannot tolerate the big supermarket. They cannot tolerate a noisy restaurant. They feel like they're inside the speaker at the rock concert. There could be sensory overload or the fear of sensory overload, because a smoke alarm went off in that room last week and they're scared to death it's going to go off again. You've got to rule sensory out and hidden painful medical problem out first. And then you'd have to start working on it behaviorally, and I don't have time to, you know, question you today on that. LINDSEY: Thank you so much. CONAN: That's a - those are good questions to start with, Lindsey. Thanks very much for the phone call. Appreciate it. CONAN: Bye-bye. And let's go to Julie, Julie with us from Tallahassee. JULIE (Caller): Oh, yes. Hi. I was calling to thank you, Temple, because my husband - not my child, but my husband is Asperger's - he has Asperger's. And he was always getting into trouble at work. He's a professor, and he has a tendency to not catch the cues, the eye movements. And people are upset because he's just said what was on his mind. And after I heard you talk about the lack of social skills, I called him, and I was, like, honey, I figured it out. I know what's wrong. And this is what we're going to do. So we were able to really work on it, and he still calls me from conferences that he attends and he'll say: Did I insult them, that I said this? JULIE: And, you know - and all that. It's really - it was really wonderful. He still doesn't catch sarcasm, but he's learned a lot in reading facial expressions, and I wanted to thank you for that. Dr. GRANDIN: Well, thank you very much. CONAN: Thanks for the call, Julie. CONAN: And this email from Deb in Winslow Township in New Jersey: I'm a great admirer of Temple Grandin. I'd like to know what attracted her to animal sciences and livestock. Are there other areas that she would like to study? Dr. GRANDIN: Well, I'm also extremely interested in thinking and cognition. You know, and as I said before, you know, visual thinking is only one type of autistic thinking. Another type is the patterned mind. Think origami, think chess. It's kind of a more abstract visual thinking. And then there's other kinds that's a word-thinker mind. But the person on the spectrum - and also a lot of dyslexic and ADHD people, it's - they tend to be good at one thing and terrible at something else. Dr. GRANDIN: Education needs to work on building up the area of strength. And I've - you know, how the brain works, how things - that's another thing that I'm really fascinated with. CONAN: I always say that when I was in school, I always had trouble with those courses where there was only one right answer. Give me some fudge room, and I was all right. English and history I was good at. Temple Grandin, thank you so much for your time today. We appreciate it. Dr. GRANDIN: Oh, thank you for having me. CONAN: And Temple Grandin is the name, also, of a new movie on HBO. It stars Claire Danes, and it debuts on Saturday, February 6th. It's about the story of Temple Grandin's early life. Coming up, Robert Kagan joins us to argue that the time for regime change in Iran is now, but this moment for President Obama is fleeting, he says. Stay with us. I'm Neal Conan. It's the TALK OF THE NATION from NPR News.